Hazardous Waste – Arctic Foundations Inc. The containment and immobilization of hazardous materials using ground-freezing technology is a relatively new field, even though ground freezing has been in use for well over a century. Ground freezing is certainly applicable inasmuch as the geotechnical characteristics which ground freezing enhances are ideally suited to the control of waterborne pollutants. The change of state of water from liquid to solid has an obvious immobilizing effect. The challenge with ground freezing technology is to be technically and economically viable over the long term, considering that few, if any, conventional ground freezing applications have been utilized for long-term applications. AFI's hybrid thermosyphon technology is a well-established technology that is ideally suited to the long-term containment and immobilization of many subsurface hazardous wastes that the U.S. Department of Energy has targeted as part of their environmental management program. These contaminants include tritium, strontium 90, DNAPLs, and many others. The temperature of the barrier can be adjusted to ensure the necessary liquid-solid phase change. Frozen barriers can be developed in soils that are saturated or relatively dry. Can be applied at any depth from the ground surface, or its application can be restricted and applied only to a predetermined zone below the surface. Can be used to form a vertical, horizontal, or angled impervious barrier, or as an encapsulating soil mass. Excavation is minimized as Thermoprobes are installed by drilling or driving. 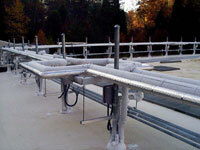 A system can be installed quickly if necessary. Regulatory issues are typically non-controversial due to minimal environmental impact. Thermosyphon technology compares favorably to many of the non-freezing technologies, including microbial barriers, sheet piling, slurry walls, grout injection, pump-treat-inject, insitu vitrification, and membrane barriers. Confinement of a buried hazardous waste can be accomplished by directly freezing (immobilizing) a contaminated soil mass or by surrounding it with a frozen barrier. To prevent the migration of liquid borne contaminants to or by the ground water with a barrier approach, all sides, including the underside, must be effectively isolated by an impermeable barrier. It can also be important to seal the surface over the shallow buried waste sites to prevent the intrusion of surface water (rain, snow, etc.) that would add unnecessarily to te volume of liquid being contained. The arrangement of Thermoprobes (AFI's thermosyphons) for the creation of frozen barrier walls would depend on the topography and underground disposition of the waste deposit. Thermoprobes can be installed in all positions - including vertical, angled, and horizontal - and spaced to create a continuous frozen barrier wall of most any required shape and size.